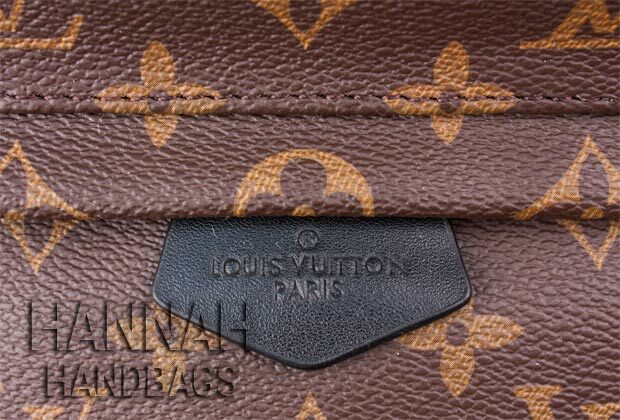 Louis Vuitton is certainly one of the most reputable producers of designer handbags. By using fine quality material and employing modern techniques, the brand has established itself as a leader in luxury handbag production. 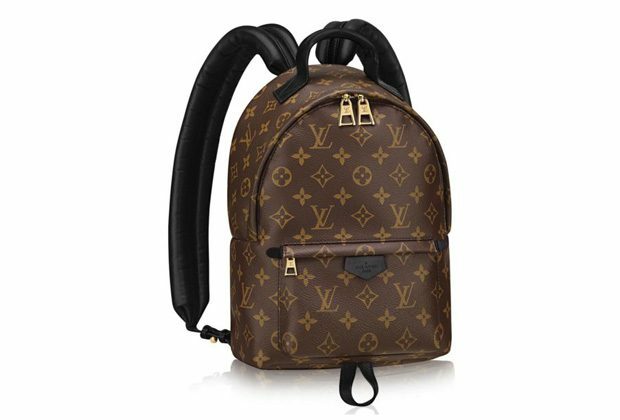 The Palm Springs Backpack PM Monogram is one of the amazing products in the Louis Vuitton collection. The handbag perfectly unites modern fashion with a hint of traditional design to produce a unique and elegant bag. It is strong, durable and is loved by people from all corners of the world. The popularity of the bag has been exploited by forgers who create fake Louis Vuitton bag and sell to unsuspecting buyers. 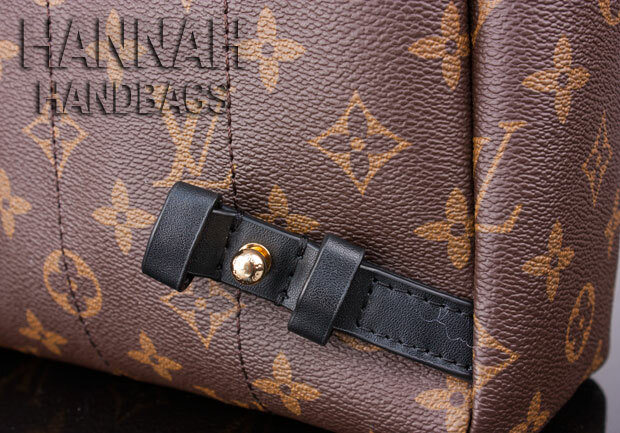 Despite the efforts by forgers to produce identical bags to the Palm Springs Backpack PM Monogram, they miss quite a number of details that can be used to distinguish a genuine handbag from a fake one. 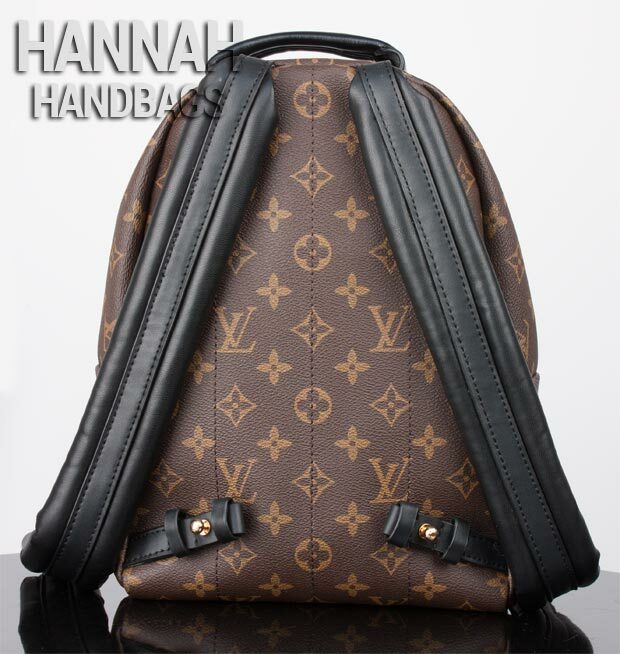 The following is a comparison of a fake and genuine Palm Springs Backpack PM Monogram. One of the first areas to consider when comparing a genuine and fake Palm Springs Backpack PM Monogram is the stitching. Louis Vuitton takes every measure to ensure that the stitching of every handbag is perfectly done. 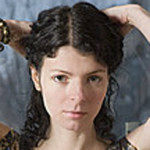 They use modern techniques in their stitches to achieve perfection. The stitches of a genuine bag are therefore impeccable. There are neither uneven nor missed stitches all through the bag. The fabric joints are also perfect with no visible damage done to the fabric. This is however, not the case for a fake Palm Springs Backpack PM Monogram. Despite trying very hard to imitate the stitching of the genuine version of the bag, there are usually some noticeable flaws. The stitches are not only uneven but imperfectly sown into the fabric as well. For some of the bags, there are even cases of double-stitching. Pay attention to the hidden spots such as the pocket areas. 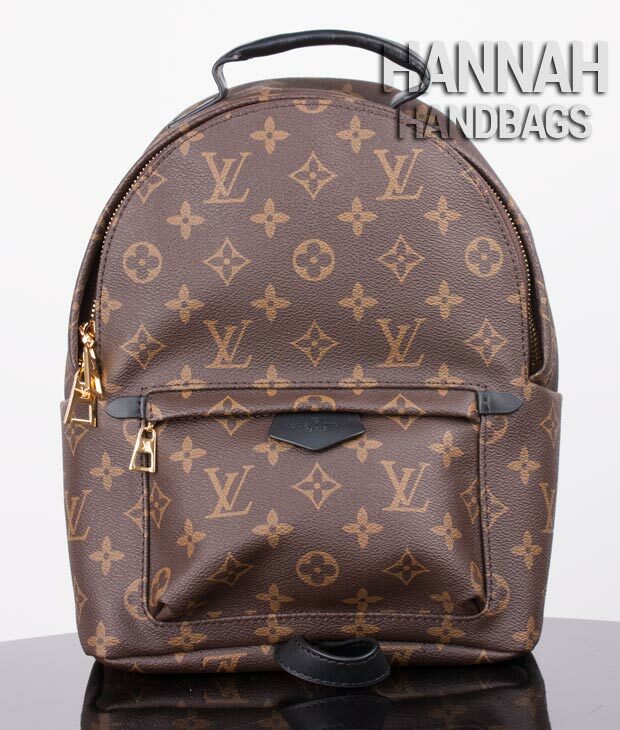 The hardware is another common element to consider in the comparison between fake and genuine Monogram Palm Springs Backpack Mini. The zip for instance, is a great place to start. 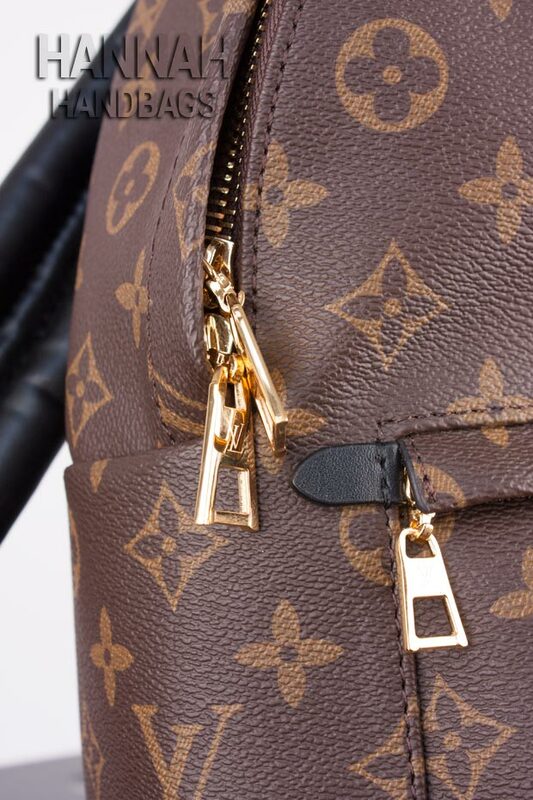 Louis Vuitton uses a characteristic polished brass for its zippers. The zippers are shiny in color and feel a little heavier due to the quality of material used in their production. Comparing the zipper of a genuine Monogram Palm Springs Backpack Mini with that of a fake one, you are likely to note that there is a difference not only in the color, but the quality as well. For the fake handbag, the zipper is golden colored. Although it appears shiny while new, it loses this feature within a considerably short period of time. The zipper is also lighter since it is made of poor-quality material. Comparing the straps of a genuine and fake Louis Vuitton backpack is another brilliant and easy way of spotting the difference between the two bags. 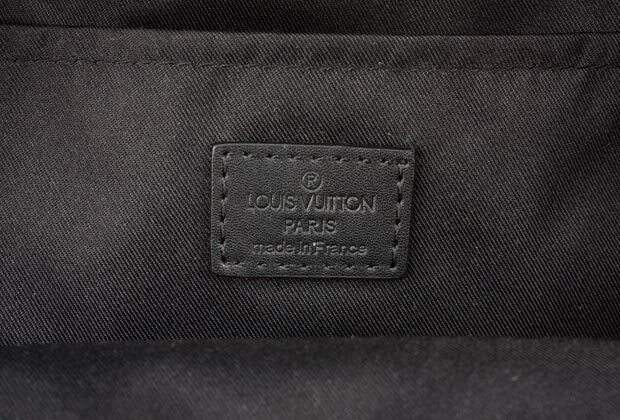 As would be expected of a luxury bag, the Louis Vuitton brand have straps made of fine quality material. 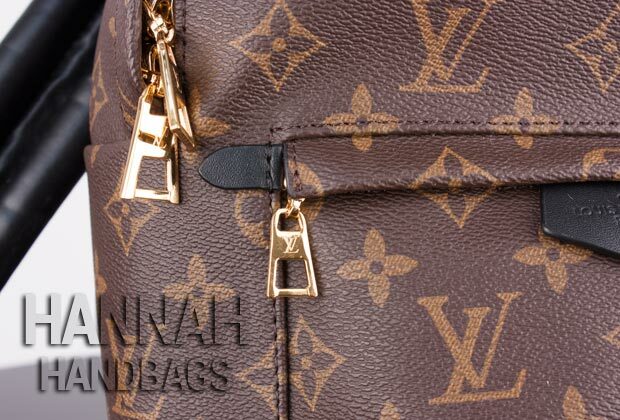 The material used on the strap of Monogram Palm Springs Backpack Mini is strong and elegant. Its slightly shiny and maintains its color for significant periods of time. Aside from the quality material used on the strap of the bag, the design of the strap also looks quite different from that of a fake bag. A genuine bag has narrow and long straps. At the top and bottom of the straps are hooks that are used to fasten them onto the rings attached to the body of the bag. This is pretty different from the strap of a fake Palm Springs Backpack PM Monogram. In the fake handbag, the strap is made of low-quality material as can be seen from the stitching. The straps are also shorter as compared to those of a genuine bag. Another noticeable difference is the width of the strap. On the fake bag, the straps are approximately 3 times wider than that of an authentic bag. 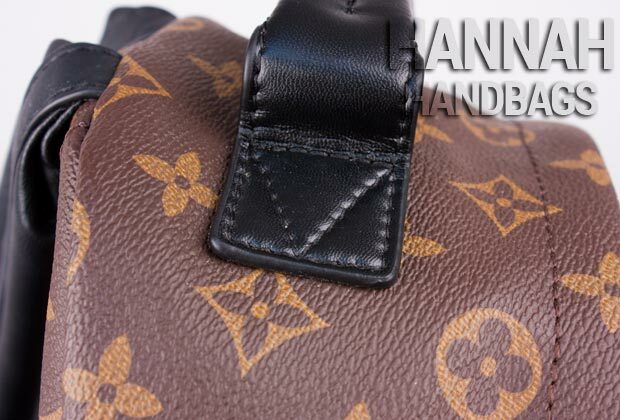 One side of the strap of a fake Louis Vuitton Palm Springs Backpack PM Monogram is sawn onto the body of the bag. The other end is attached to the body of the bag by a piece of material held in place by snaps. A comparison of the interior of a fake and genuine Palm Springs Backpack PM Monogram also reveals some noteworthy differences. To enhance the strength and durability of its bags, Louis Vuitton uses suede for the interior of the bags. 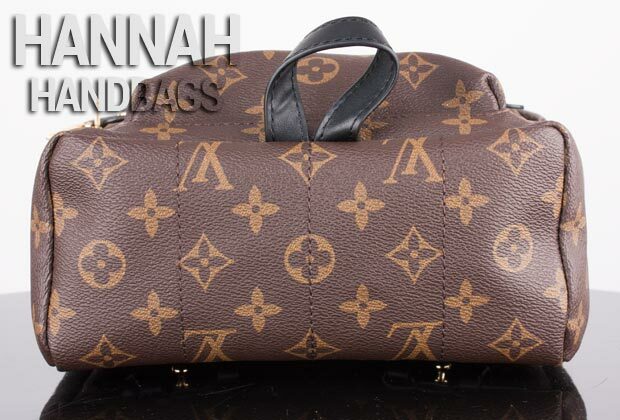 This contrasts with the interior of the fake Monogram Palm Springs Backpack Mini. Rather than the suede interior, the fake bag has a thin lining. 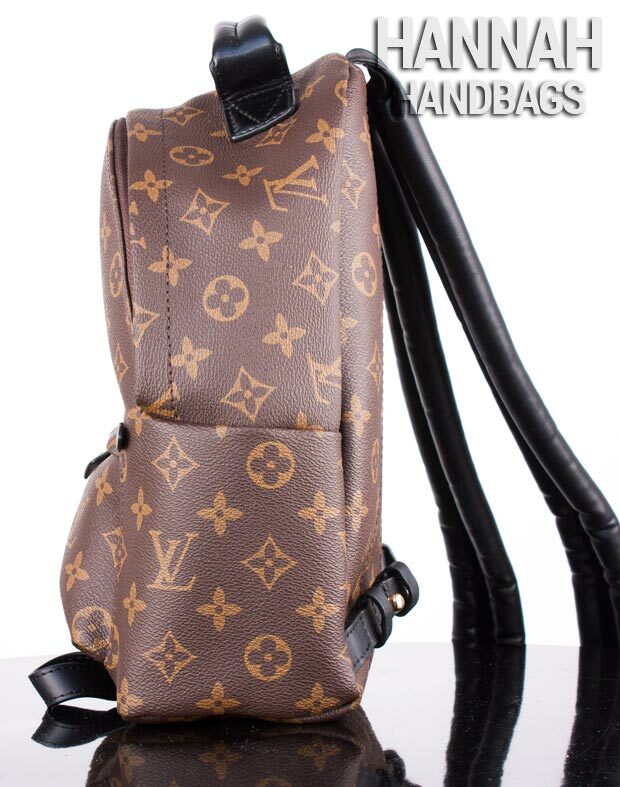 In the comparison between a fake and genuine Louis Vuitton Monogram Palm Springs Backpack Mini, it is evident that the fake is made of inferior quality material and craftmanship to cut down on the costs of production.